Men, no longer of draft age, were required to register at their local draft board, just in case the U.S. needed them for their occupation, etc. The registration of 24 million men occurred at three different times during the years 1917 and 1918. The first registration occurred on 5 Jun 1917 for men ages 21 to 31, the second on 5 Jun 1918 (though a supplemental registration was held in August of that year) for men born June 6, 1896 to June 5,1897, and the third on 12 Sep 1918. This last one, for men between the ages of 18 and 45 not previously registered or already in the military, born between 11 Sep 1872 and 12 Sep 1900. 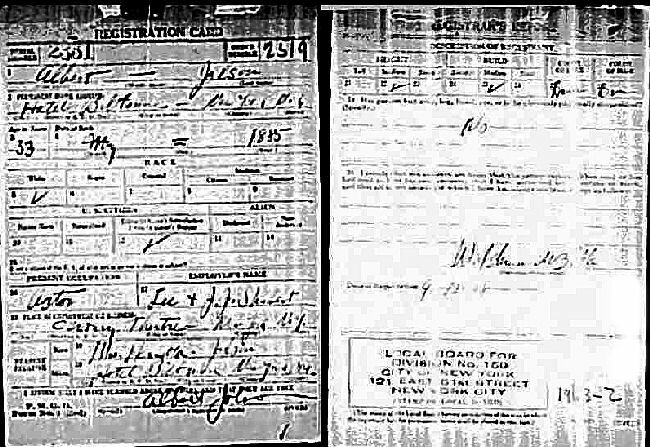 This last registration was the one that Albert (Al) Jolson, the "Jazz Singer" and my favorite singer of all time, registered in, being age 33 at the time. Also it should be noted that the information asked for on the cards used during these enrollments varied slightly, depending on the registration period. The cards for the first two registration periods included a space for the town and country the registrant was born in. The last one did not. For genealogists, this draft card supplies some information that could be of value to their research. 15. If not a citizen of the U.S., of what nation are you a citizen or subject? I affirm that I have verified above answers and that they are true.